Meanwhile, researchers insist that there is a great deal to be learned from the trove and maintain that they are being as unobtrusive as possible with the excavation. 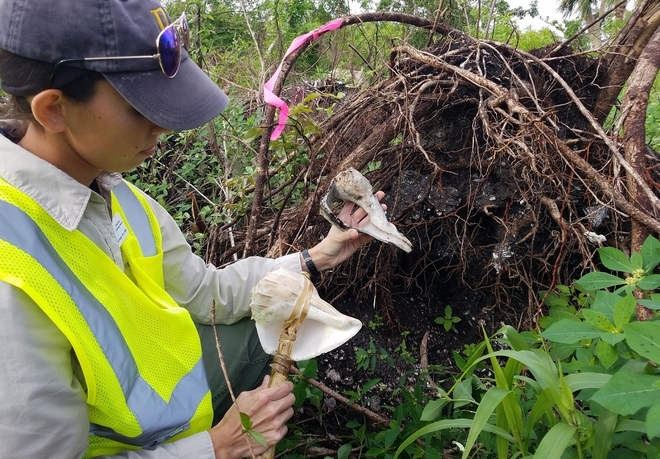 “We want to take as little as we can, we want the site to stay as intact as we can,” archaeologist of Rachel Kangas from Florida’s Public Archaeological Network, which is affiliated with the University of West Florida told WGCU radio. Responses to "Hundreds Of Calusa Tribe Artifacts Unearthed By Irma To Be Curated By Museum"
The only way to preserve the the Identity of an extinct Calusa tribe would be to Curate By a Museum, Humans need to take the next step up the ladder of evolution and realize spirits and gods do not exist, without curation the memory of these people will be lost to time. Donny, just because you do not have experience of spirits and gods does not mean they do not exist. Some people are color blind. Elephants can hear things people can't. Dogs and bears smell things that people can't. It is illogical to think that the limits of your perception define all existence.